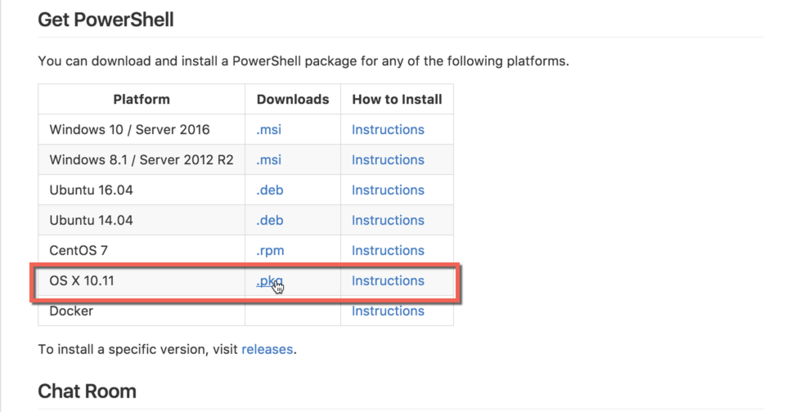 I’m sure you’ve seen it, PowerShell has been open sourced and is now available on OS X and Linux. Good news is, you can also run PowerShell on macOS Sierra beta in everything I’ve tested so far (I spent more of the day the other day just writing and running Powershell within macOS beta). or by opening the .pkg. If you install by open the .pkg, you’ll need to right click on the file and select open (rather than just double clicking) due to it not being signed and coming from and “unverified developer”. Walk through the install process shown in the following screenshots, there is nothing unique about the install, just a typical macOS application install. Here is a quick video showing the install process using the terminal, running some PowerShell and then modifying Visual Studio Code to make PowerShell my default environment. Launch your Terminal, this could be the native Terminal, iTerm, etc. Add the line: "terminal.integrated.shell.osx": "/usr/local/bin/powershell"
Save the File and Reopen Visual Studio Code. Now when you open the integrated terminal it will be running PowerShell.